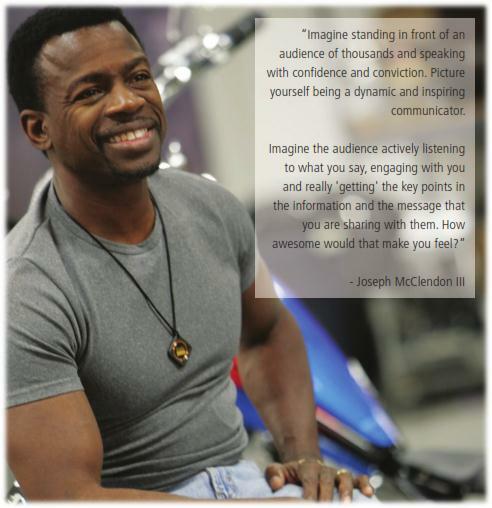 Joseph McClendon III is a world-renowned motivational coach and public speaker. He has presented, spoken to and inﬂuenced more than 3 million people around the world. Joseph has spent the last three decades learning and acquiring new skills and techniques and has pursued a quest to perfect the art of becoming a master communicator. He has a presence and speaking technique which is formidable to behold. Now for the ﬁrst time, Joseph will share the secret to assist you in becoming not just a speaker, but will assist you in becoming a GREAT speaker. Joseph recognises that for most people one of their greatest fears is that of public speaking. Over his career, Joseph has observed that so many speakers and coaches have spent thousands of dollars and many hours acquiring knowledge in their ﬁeld. And yet ﬁnd it challenging to communicate at a level which moves their audience to act upon what they teach. Many times Joseph has heard his business partner say there are many people who have written a great book, but very few can emulate the stage presence, charisma and speaking style to truly deliver the message they want to convey. It’s a bit like owning a Ferrari, knowing how to drive it, but not having the key to start the ignition.